Over 120 American brewers pouring over 550 different craft beers. Three 3.5 hour sessions over two days, bringing in almost 15,000 beer-loving fans. This is a huge weekend! I was first introduced to Lawson's at last year's American Craft Beer Festival, and if wasn't already then, brewer Sean Lawson has really become something of a beer legend. He ships his beer no where: the only place to get it is at the brewery and one or two stores down the street. He won't discuss his recipes with anyone. Doesn't give tours. The secrecy and rareness of the beer really adds so much mystique to his work, that there are lines stretching across the entire venue just to taste it. But can the beer live up to they hype? Absolutely. Sean poured five beers this year: BIG HAPI, a 7.5% black IPA; Knockout Blonde, a 6.1% American blonde; Permagrin Rye Pale Ale clocking in at 6%; Maple Tripel, an 11% monster tripel brewed with maple syrup; and the beer that's made him famous, Double Sunshine IPA, an 8% Imperial IPA. Damn. This is the spiciest liquid I have ever drank. I've had a few chili beers (there were maybe a half-dozen available at ACBF this year), but Ghost Face Killah (5%) makes every other beer look tame. "GFK is brewed with 6 zany peppers. Anaheim, Fresno, Jalapeno, Serrano, Habanero and Bhut Jolokia – Otherwise known as the Ghost Pepper. 200 times the heat of jalapenos, Bhut Jolokia are the hottest peppers in the world, a pepper so hot it can be weaponized. So hot that our brewers had to wear masks and gloves to cut them up. Aroma of smoked chillis fills the nose on first whiff, but don’t let it linger to long. Immediately on first taste GFK has a nice golden wheat flavor, but this is only for a fleeting moment before the temperature rises. Just hold on, the warmth of this beer will set in for a long spicy burn. There is only one finish on this beer – HEAT!" They go on to encourage pairing the beer with ice cream or milk because "that is all that is going to help you with this brew." And they ain't kidding; my mouth was on fire for about twenty minutes before my sense of taste started to return. This is one occasion where the 2 oz. pour was just enough; I think I'd die with anything more! 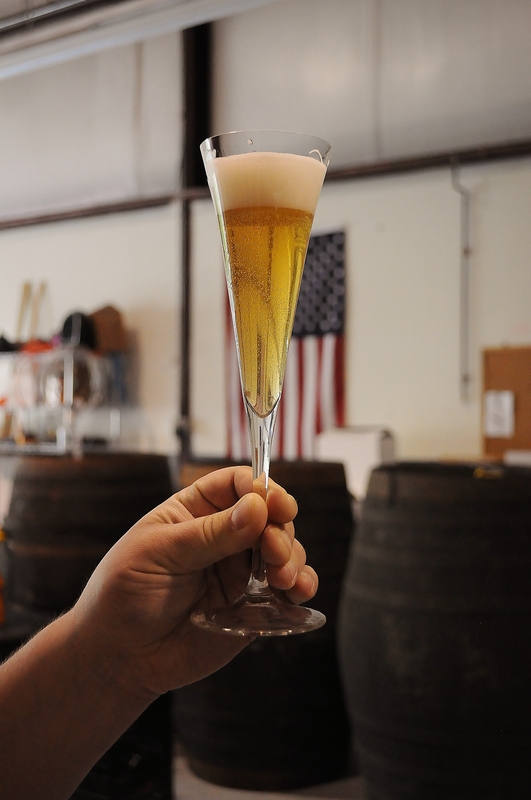 Enlightenment makes one the country's few Bière de Champagne. It's a beer I've been reading about for some time, and was finally launched at this festival. The process and exact recipe, which brewer Ben Howe has been been perfecting for the past three years, is highly labor intensive. It basically involves creating a beer with both Belgian and Champagne yeast strains. 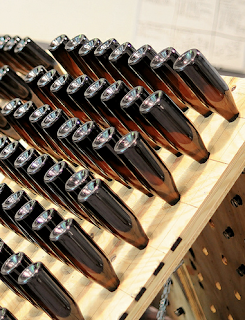 At bottling, the beer is racked at a -45° angle, and rotated 45° every day. This allows the Champagne yeast to settle at the neck of the bottle. After several days (I cannot remember the exact number), Ben flash-freezes the tip of the bottle, opens the bottle, removes the frozen Champagne yeast, corks, and cages the bottle. The result? Crisp, fruity, effervescent goodness that is a perfect marriage of Champagne and beer. This is a beer worth sharing over that special occasion! In my estimation, Franklin's might have been ACBF's best kept secret. A tremendously unassuming label and rubber chickens all over the booth really led me to write off this brewery before I even had them. Positioned next to Duck-Rabbit (another amazing brewery), I was simply there and there was no line, so I thought I'd give it a try. I was blown away. Brewer Mike Roy – a tremendously nice man who is more than happy to talk beer all night – brought ten of his beers to the festival. I won't list them all here, but a few highlights were Mic Czech (a 5.4% Pilsener that was authentic yet new, clean and fruity with hints of citrus), Petite Fleur (a 5% Belgian Pale that is easily my favorite American representation of the style – sorry BPA, you've been dethroned), and Belgeastie Boys (an 8% Imperial IPA that was every bit as good in the mouth as Double Sunshine, though it lacked the same powerful aromas). Also worth mentioning was Blasphemous: an 8.1% American Wild Ale that drank like a 6% beer, and showed as the strongest sour of the evening. Mike was relating that his vision for the restaurant was a Cracker Barrel style restaurant with better food and beer. "You have a family, and you want to be able to go somewhere your kids will enjoy. But you don't want to sacrifice good food and you still want a great beer," Mike explained. What a concept! I haven't had the food, I've never been to the store, but I can promise you that the next time I'm in DC, this is a must-visit. All in all, this was an amazing festival. I could go on for many pages with the various beers I enjoyed, but these were the true highlights that really stuck out. I've got at least two other festivals I'm visiting this summer, so it will be fun to compare. I'll be sure to note my impressions here. As an aside: I did speak to Dann Paquette, the brewer of Pretty Things. I told him how moved I was by his Belgian Session Ale, Magnifico, which I tasted at last year's Belgian Beer Festival. I then gave him a bottle of Churchyard's The Magnificent Mr. Monk, explaining that this was modelled after Magnifico. I asked for his feedback, and if he offers any, I'll be sure to post.